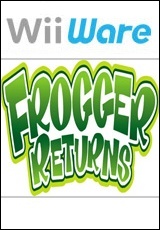 Being an old school fan of frogger this game was a must, with its 2D gameplay, 3D graphics and new levels and enemies. The game still has the same old feel of gameplay that I remember playing so many years ago. Something new is the multiplayer option which adds extra fun. Alongside that we of course have the Single Player Mode. You are presented with several choices for both Single Player and Multi-Player mode. With multiplayer you get the 3 options. Classic race. Which is basically a race to see who gets to the finish line the fastest out of 5 frogs wins! Territories is a race to see who occupies the most goals before the buzzer. “Collector” is similar to “Territories”, with the added option of collecting bugs to give you a score boost. Finally “Fly feast” is a battle to see who can eat the most flies! Mmmmm yummy! There are four different single player modes. We have the classic Arcade, Time Trial and Score Attack which is basically trying to achieve the highest score possible. And last we have Free Play which has no time limit, unlimited lives and no score. In Arcade Mode you get a cool option of power ups. These allows you to put the game in pause mode or give you extra time. Can also freeze objects on screen, reverse the traffic. Keep in mind that the powers up are random. The levels are well designed. 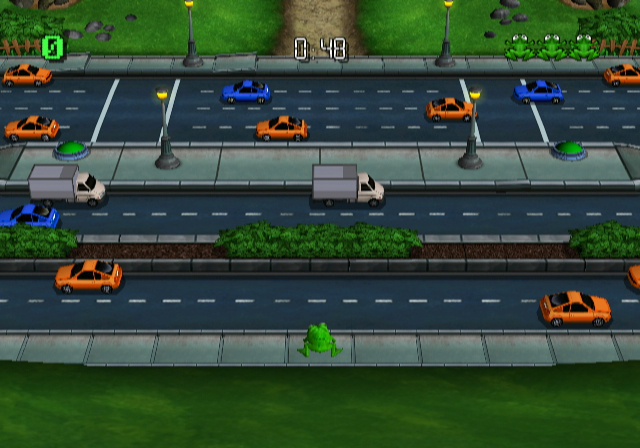 The levels go from dodging traffic, avoiding dogs, logs and turtles. 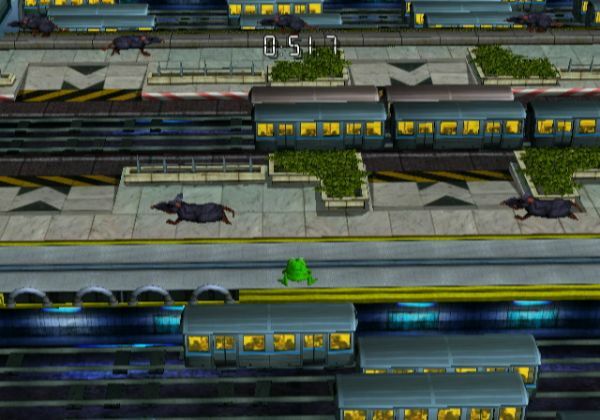 As you progess through the game you are also presented with levels in a subway where you surf avoid trains, and ride barrels floating in waste. The game has two viewing angles. In multiplater mode the isometric view can be a little tricky to navigate at times. A top-down view is used in multiplayer modes, there is no option to use the same view in single player mode. Worth the 500 Wii points. Good gameplay, new levels, and cool music! No online play makes it disappointing for multiplayer, and the control method can get irritating.